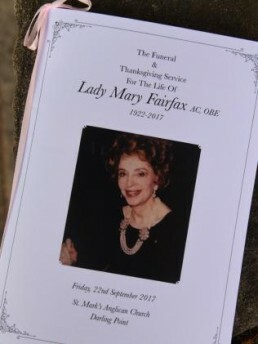 THE reclusive family of Lady Mary Fairfax AC OBE was joined by members of the community, politicians and representatives from some of the nation’s most prominent families for the funeral of one of Australia’s most generous philanthropists and most intriguing women. Mourners at Darling Point’s St Mark’s Anglican Church for the 10.30am funeral of the 95-year-old socialite who died on Sunday included Premier Gladys Berejiklian and Bronwyn Bishop. The order of service for the funeral service of Lady Mary Fairfax.